Tweak job contest: Win a free Bloof book or tee shirt! 1. Write a poem or prose piece based on a line, title, image, or whole poem by Peter Davis. You may borrow a bit, or create a wholly new piece "in the manner of," etc. Alternatively, you may illustrate it or respond to it in music, whatever. How you tweak it is up to you. 3. IMPORTANT: Let us know you've entered, and include a link to your piece. Contact us via comment here, the Facebook page, or send an email to info [at] bloofbooks [dot] com. 4. Winners are chosen by random drawing. Emails will be assigned numbers in the order they are received. A random number generator will be used to choose winner(s). One copy of Poetry! Poetry! Poetry! will be awarded per 15 entries, up to a maximum of 5 winners. (So, if we get 36 entries, 2 winners will be chosen; 45 entries equals 3 winners; if we get more than 90 entries, we will be happy but we will still only award a maximum of 5 books.) One grand prize winner will receive a Bloof tee shirt in addition to the book. 5. ALSO, our favorite pieces will be collected for a little feature at Tweak Job. 6. Tweaking begins Tuesday, June 7 and ends Saturday, June 30. NOTE: ONE entry per person/email address. There no restrictions to US-only entries, or any silly business like that. We will ship the prizes anywhere. No purchase is required to enter. Time Out Tel Aviv features Peter Davis & Poetry! Poetry! Poetry! 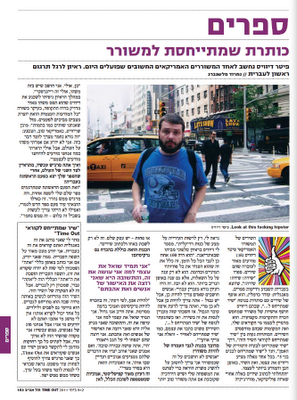 Click here for the full issue (in Hebrew). Pete's on p. 163.
the headline is "a headline addressing a poet". under that, it says: "peter davis is considered to be one of most important american contemporary poets. we interviewed him for his first hebrew translation." then nimrod writes: "peter davis' poems are very aware of the fact that they are poems. his book, poetry! poetry! poetry!, that was published this week (yediot book, from the english: oded carmeli) is a collection of poems with headlines along the lines of "a poem addressing...", in which davis reveals a personalty of a poet searching for recognition and professional success. he imagines who his readers are and the places where they read his poems. the titles are anywhere from "a poem addressing the readers of this poem", through "a poem addressing the fundamental problem of the artist" to "a poem addressing boys, age 5". in each one of these, davis offers himself, and the poem, in a self-conscious and honest way. then you tell the story of the guy from virginia who ran for governor on a ticket of honesty. then nimrod asks you about if you're trying to be honest about the position of the poet. then you answer that people don't think poets need jobs to support their families, ect. then nimrod asks does the honesty also include narcissism. then you say that being an artist is being a narcissist. then nimrod (who has a crush on marx) says: "this is a very capitalist notion, selfishness that supports a greater good". then you agree, saying it is kind of regen-like. then nimrod says that during the interview he tried to convince you that you captures something essential to the zeitgeist but that you, being a good american, try to keep modest: "it's really nice of you to say that. i don't if i said something about the world, but maybe i was able to describe how aware we all are about our self awareness". then nimrod asks you how it feel to have a book out in the other side of the world, and you reply: "this is the first time one of my books was translated, and it feels really great. it's like i published a whole new book without having to work for it - which is really nice". and then they printed the poem you wrote for the readers of Time Out. It's weird to me that I'm writing this in English and you're reading it in Hebrew. I know very little about the Hebrew language. From what I understand, if I write a generic "you" (meaning to whomever is reading this), the Hebrew language will make that "you" become a masculine "you," referring only to the men. But, that is not the case in this poem. This poem is just as much for women as it is for men. It is for grandparents and children. Anyone could be reading this! I have no idea who you might be! And you don't know who I am! But we're sort of meeting now! I hope this poem isn't too long but I so rarely get to directly communicate with the people reading the cultural section of Ha'aretz and so I feel like I should add at least one more sentence. It seems like I should try to say something substantial, something profound, something really, really beautiful. Yedioth Ahronoth just released the Hebrew translation this week. And naturally the English version remains available from us here.